I love the way the French do picnics – they just rock up with a basket, plonk it on a table or on the grass and produce from within it some bread, cheese and wine. Et voila! Lunch is served! Do not be mistaken into thinking that this simplistic approach somehow equates to a dull, boring meal. Mais non! It is in fact rather wonderful and contains all the elements to put a big happy smile on your face. So I started to think about picnics from this rather unfussy French mindset and I agree that a picnic should not be something that has taken you a long time to prepare. I also don’t like hauling great bulging bags full of Tupperware about with me, I want food that is portable and once consumed can be cleared away quickly and without fuss. So I decided to knock up something that the French call ‘Cake’ but is actually sort of like a savoury loaf of bread….sort of thing. I might not be explaining this very well but trust me when I say no matter what you call it, it’s really very good! I took inspiration from the French recipe magazine ‘Gourmand’ where they did a special edition all about these cakes with many versions and ingredients. I decided to use bacon lardons, figs and walnuts in my cake which I felt would compliment chunks of cheese and of course, red wine! This cake doesn’t really need anything else. It doesn’t need butter or any sort of topping. It is hugely moreish and light. Quick and easy to make and transport, it’s just splendid picnic food that will definitely satisfy and impress. So, start thinking French and get your Pique-Nique on! Pre-heat your oven to 180C. In a small frying pan, fry up your bacon bits until cooked through and golden. Reserve them on some kitchen towel to drain off excess fat. Crack your eggs into a bowl and whisk them a little with a fork. Then add the flour, the yeast sachet, the oil and the milk and stir to combine. Then add in your bacon bits and chopped figs and walnuts and stir again. Season. 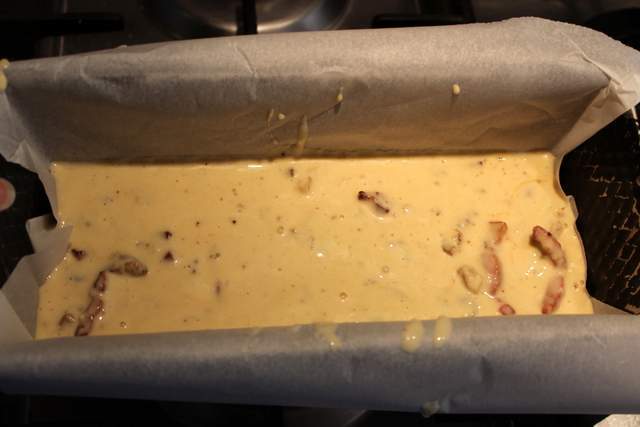 Line a loaf tin with baking paper and pour in your cake mix. Cook in the oven for 45 minutes. Check it is cooked through by testing with a skewer. If it comes out clean, it’s cooked. Let the cake cool on a rack and then slice and serve. I am also entering this little cake loaf into this months Credit Crunch Munch as one of these little beauties is really all you need for a lovely Picnic lunch so it’s therefore very good value! Hosted by myself this month, created by Helen from Fuss Free Flavours and Camilla from Fab Food 4 All. And finally, I am entering this cake into Panissimo, a wonderful yeast based bread challenge co-hosted by Barbara from Bread & Companatico (this month) and Sandra from Indovina Chi Viene a Cena? 34 Comments on "Un Pique-Nique Francais (French Picnic with Bacon, Fig & Walnut Cake)"
Wow what an easy bread, sorry cake, recipe this is! And I’m so loving your flavour combination of lardons, figs and walnuts – it has to be good! A couple of large lumps of fine cheese and a bottle of vin blanc this has to be The Perfect Picnic, and a very worthy entry to our new challenge! Well done you. Thanks Fiona. I agree…no need for butter or soggy tomatoes. It’s an all in one stop lunch time treat! What a wonderful picnic! Your walnut cake looks delicious and simple to make. I can’t wait to give it a try. This is so easy to pack up for picnic too. Thank you so much for sharing. Thank you Amy. I am glad you like it. It’s as easy and tasty as it looks. The lovely nuggets of walnut and the slight crunch of the fig seeds with the salty bacon… I defy you to stop at just one slice! I certainly couldn’t! I make breads like this but I’ve never used yeast! Fascinating! Oh yes please! Next picnic I’m going on, I’m going to be baking one of these to take with us! So many of my favourite ingredients in one loaf, I would love to be on that pique-nique! bellissimo questo pane per pic-nic! grazie per averlo mandato a Panissimo! Ahh, I can imagine this ‘cake’ with some white wine, fresh fruit and a small ‘tarte aux fraises.’ Can anyone join these competitions that you run, or do you have to be located in Europe or France somewhere? Maybe I should get off my duff and join one! Anyway though – I like the look of your cake a lot. 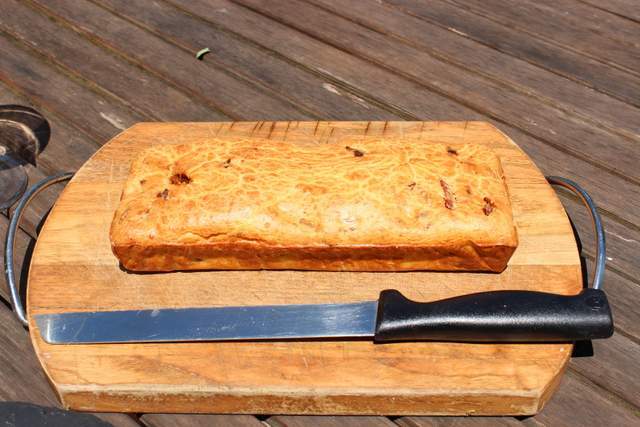 I do like the French “cake”, and it would make a very welcome addition to any picnic – elaborate or simple! This looks so delicious and just my sort of recipe, not too elaborate to make and using bits of bacon (loving the fact that we still have lots of ‘pancetta’ etc from the pigs we reared last year) plus no need for butter. Bet it’s so yummy with red wine and goats cheese. Lovely post. Oh yes, I could eat a savoury slice on many a picnic. 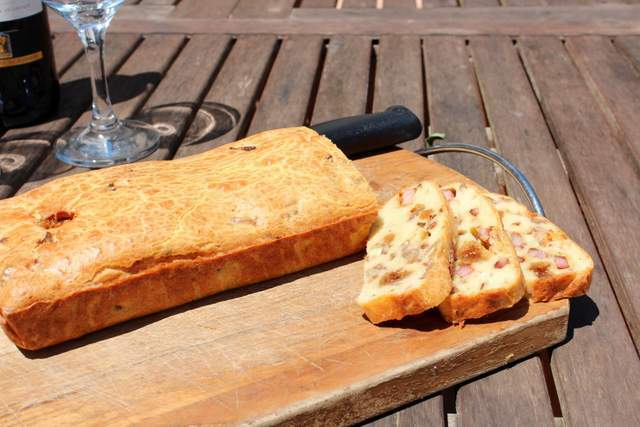 The perfect portable savoury loaf and so delicious with the figs, bacon and walnuts. Yum! Yes Laura, you are right…many slices go down ever so easily with this cake! Don’t take too many people with you on your picnic and then you won’t have to share it so much! I’m with you on those savoury cakes (and I’ll definitely try this one). So much nicer than the standard sweet French ‘cake’. I’m looking forward to our regular Sunday picnic with our walking group. Someone’ll produce an apero, someone else home-cured sausage. There’ll be at least a couple of different home made cakes or biscuits. Wine. Grandad’s special hooch, served on a sugar lump. 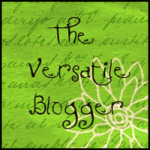 It’s a wonder we can ever get moving again…. though as well that we do after that little lot. Thanks Margaret! I am sure you deserve all those delicious treats after walking hard to work up an appetite! Grandad’s hooch sounds very interesting – is that code for Armagnac? Do let me know if you try this cake and what your walking friends think of it. Looks wonderful, I have eaten similar and you are right, very moreish. Add some sun and a glass of wine…. perfect! Thanks Anna. Anything with wine and sunshine gets my vote….I am easily pleased I think! I just received a huge box full of figs so this recipe is going to come in handy. Now I just need a picnic basket. Don’t let a lack of picnic basket stop you from making this cake! Just wrap it in tin foil and pop it in your handbag ! I love it! thank you so much for participating to panissimo with this savory bread filled with good stuff! I was also aiming toparticipate to credit crunch munch but June has not been nice tome.so good is July already (panissimo roundup will be going soon). 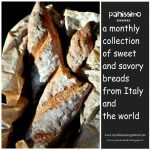 ciao and looking forward to your next breads! Thank you! Glad you like it. This bread/cake was so simple and quick….it’s definitely my type of bread! I do hope you manage to find the time to enter in to Credit Crunch Munch in July. But Summer can be such a crazy busy time of year….I know what you mean! You know how much I love figs, and these savory “cakes” are my favorite. I made a goat cheese fig pistachio cake from Rachel Khoo last year, and it was so good.